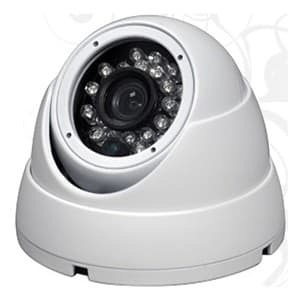 The SYSPRO-D8Q is an infrared dome HD surveillance system that includes eight 1080p HD CCTV dome cameras (AHD / TVI / CVI / CCTV), a hybrid 1080p HD / CCTV DVR, pre-made video/power cables, and power supplies. The SYSPRO-D8Q 1080P HD CCTV dome cameras that are included with this system have a 3.6mm fixed lens that provides a 90-degree horizontal angle of view. This view is ideal for mounting on the ceiling in the corner of a room. The infrared capability of the camera supports zero light video surveillance and has an effective range of up to 15 meters / 50 feet. The iDVR-PRO8A surveillance DVR that is included with this system works with traditional standard definition analog CCTV cameras as well as the latest 720p and 1080p HD CCTV cameras. Users can login to their DVR to view their cameras live and also play back recorded video surveillance footage using the Mac, Windows, iOS, and Android apps that are included for free. Here are the main features of the DVR included with this surveillance system. You can learn more about the iDVR-PRO8A here. All iDVR-PRO HD DVRs can be found here. If you are thinking about upgrading the DVR included with this system, you can refer to this iDVR-PRO model comparison chart to help decide. Here are the main features of the HD-Q3 1080P HD infrared surveillance cameras that are included with this system. You can learn more about these 1080p weatherproof dome cameras here. You can also view a video demonstration of the HD-Q3 here. Eight sets of 100 foot premade Siamese cables are included with this system. These cables allow you to run both video and power to your camera. If you need to extend your cable run longer than 100 feet, you have two options. Watch this video to see demo video surveillance footage recorded using the HD-Q3 connected to an iDVR-PRO recorder. Please make sure that you adjust the video player to 1080p resolution after the video starts to play. The video demonstrates normal light and zero light infrared recordings.